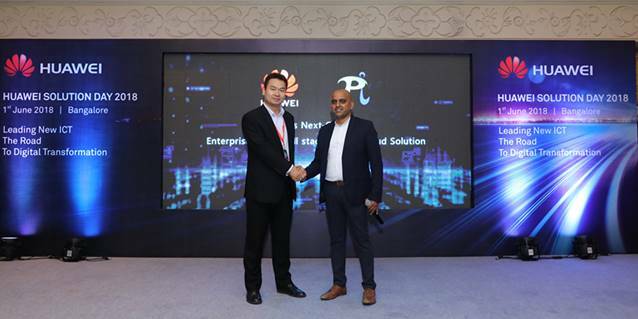 Huawei Solutions Day 2018, the first of the 3-city Huawei enterprise summit, was held today in Bangalore witnessed a gathering of industry leaders, cloud-data service providers and analysts from across industries. Under the theme of “Leading New ICT — The Road to Digital India”, the Solutions Day was a platform to discuss how Indian industry can advance digital transformation and unlock opportunities to grow the digital economy. 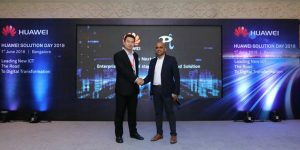 On this occasion, Huawei also launched its latest solutions the All-flash Storage Oceanstor F V5 and Private Cloud Solution FusionCloud 6.3 which enable digital upgrade with “agility and intelligence” at the core, leading to a better connected enterprise. Huawei also released the All-flash Storage OceanStor F V5. Adopting Huawei’s lightning-fast rock-solid flash architecture and with built-in cloud and intelligence capabilities, the new offerings will bring customers to a new age of data storage. eaturing high performance, flash storage plays an important role in business integration acceleration and data value mining of enterprises. With the rapid growth of data volume, enterprises have attached more and more importance to data security and reliability. The newly released All-flash Array of Huawei are specifically designed for mission-critical applications, ensuring high service availability and performance and allowing customers to further unleash the potential of flash. The new offerings demonstrate Huawei’s commitment to making data more secure, operations more efficient, and guaranteeing business continuity, all while bringing down costs for enterprises. Purpose built for flash, Huawei’s new OceanStor F V5 All-flash storage systems adopt Huawei’s proprietary SSDs, delivering up to 6 million IOPS with 1 ms latency, meeting the highest performance requirements of enterprises’ core services. The gateway-free active-active technology built inside ensures 99.9999% availability. By integrating capabilities of managing flash, NAS, and heterogeneous storage systems, this system is capable of supporting various services in private cloud environments.